No Flash? Click here for the same experience in a different format! Happy Mother's Day to all of the fabulous Mum's out there, especially the first timers! I am one of those this year and for Mother's Day my gorgeous son and very kind, generous husband gave me some TIME. A new mother can ask for nothing better! They gave me some time to finally finish off this (last!) months feature piece. 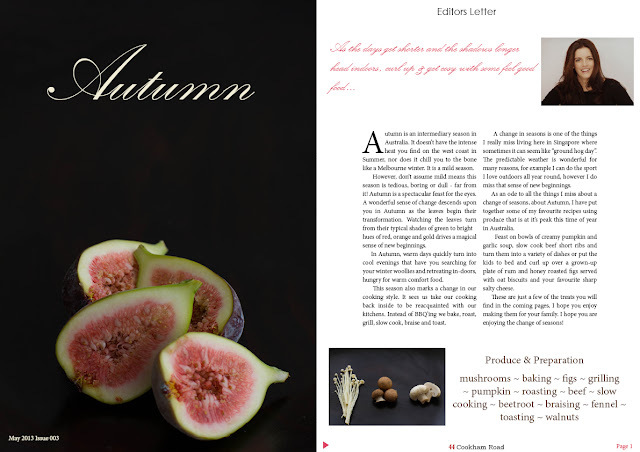 The AUTUMN feature has delicious recipes inspired by produce that is at its best this time of year in Australia. Helping you to serve up everything that is warm and comforting from the start of the day to the end of the day. If you would like to print the spread, click here for a high resolution version.